A driver hit a pedestrian as he was trying to flee the scene of an accident in Hoboken, police said. Checkey Beckford reports. 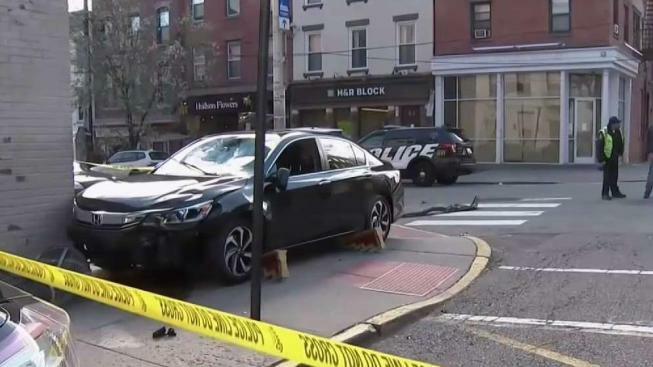 A pedestrian was left with several fractures after a driver trying to flee the scene of an accident rode up onto the sidewalk and hit a building in Hoboken, police and law enforcement sources said. The 66-year-old driver got into an accident with another car near 1st Street and Bloomfield Street around 3:30 p.m. Tuesday, police and a law enforcement source said. The driver then rode up onto the sidewalk between Court and Washington Streets and continued driving on the sidewalk before slamming into a building near Hudson Street, according to police. At some point during the incident, the driver struck a male pedestrian, who was taken to the hospital in serious condition, according to police. A driver hit a pedestrian while trying to flee the scene of an accident in Hoboken, authorities say. Checkey Beckford reports. The 56-year-old pedestrian, who was visiting Hoboken from Brooklyn, sustained several fractures, but was in stable condition as of Tuesday evening, a law enforcement source said. The driver of the other car involved in the accident wasn't injured, police said. The driver who hit the pedestrian has been arrested. An investigation is ongoing.